This garden in Chapel Hill, North Carolina, always intrigued me. 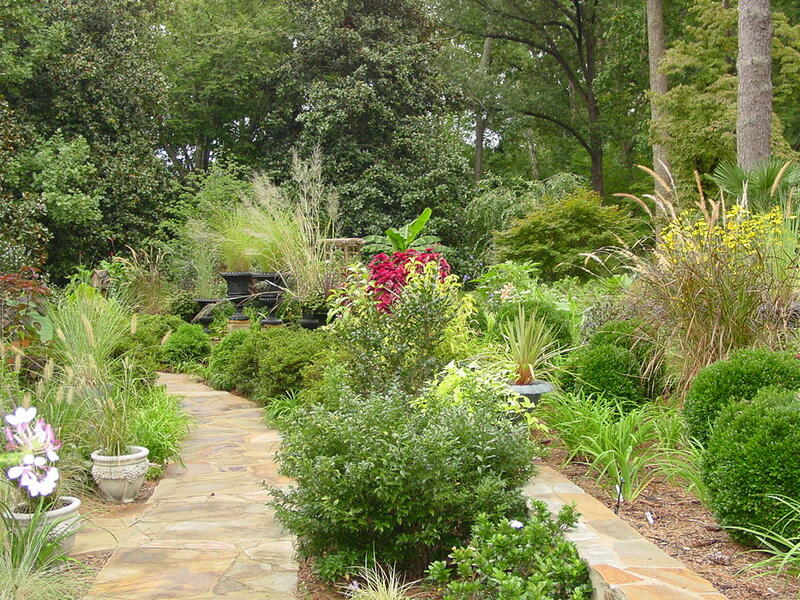 Kit Flynn, the owner, had turned her entire sloping front yard into a garden. She had a few paved walkways and some nicely placed urns, but she did have a point in calling her composition, "organized chaos." I've heard other gardeners use this term. Kit had all sorts of plants - roses, perennials, flowering shrubs - packed into what was once a quiet lawn, like her neighbors all had. In fact, as you drove down her street, you were all of a sudden startled by what you saw. I visited her garden in September. What I remember most were the grasses. She had them everywhere - in the ground and in containers. Somehow it all worked, and there was plenty to see and admire in what is usually a down-time for a Southern garden. You can't see in this view, but the front walkway going up to the street was lined with ornamental gingers, not the kind you see in Florida, but a dwarf variety. Elsewhere, she had a mishmash of yellow composite daisies (there is a crude term for this, but I can't remember it now and wouldn't write it if I did), sedums, including a flopping patch of 'Autumn Joy', Japanese maples, boxwoods, banana plants and several other tropicals. I liked her garden a lot (it was featured on an episode of A Gardener's Diary on HGTV), but I'm already so chaotic that I would not be able to keep up with a garden like this. The main thing, though, is that she enjoyed her creation so much and loved every minute of the experience. She didn't mind taking chances, and some of her combinations were quite stunning. I think the thing that saved her was that she had invested in stone paving and some evergreens that gave the eye a bit of relief. Otherwise, it would have been a very chaotic sight. For a September garden in the South, though, I would say it was quite successful.